Web based basemaps can provide an excellent context for a mapping project. Map services such as OpenStreetMap and Bing provide tile services that can be used to fill in details such as topography, road networks, hydrography and satellite imagery for a map without having to provide your own set of base features. 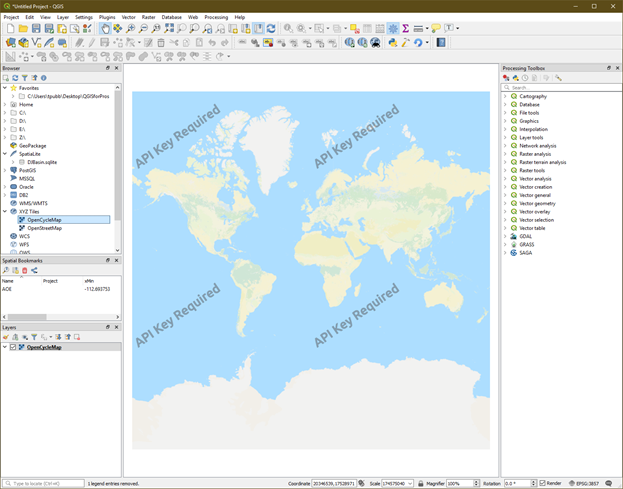 While QGIS is a Free and Open Source Software (FOSS) package, and many of the plugins that are available for it are as well, you must be careful to follow the license agreement for the base map layers that you are displaying. For example, Google Maps provides a map tiling service for non-commercial use only. Click the “Plugins” menu item in the top menu bar and select the “Not Installed” tab from the left pane of the plugins manager. Search for “quickmapservices”. 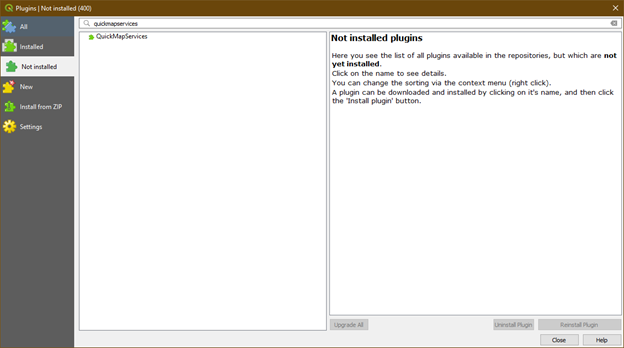 Select the plugin and install it. QuickMapServices will show up as a new toolbar on your main toolbar list. There are three globe icons in it. Selecting the middle icon you will see a drop down with all the available basemap providers. Select whichever basemap you want and it will be added to your map canvas immediately. Some map service providers require an API key to be used in conjunction with their map tiles. If you have your own basemap service, or one you prefer to use in XYZ format. You can add it to your project by adding it to the XYZ tiles in the browser pane.